Among the semi-deserts and dry plains of southern Africa roams a small, sand-colored mammal. This creature, the meerkat, is a part of the mongoose sub-family. Like most mongooses, the meerkat is very active and social. In fact, meerkats typically stick together in groups of 30 or more to find food and to protect one another from looming predators. Using a ‘sentry-duty’ system, meerkats rely on one another to stay safe while foraging for food in open desert areas. They use their sharp eyesight, long claws, and strong forelegs to track down insects like termites and beetles, scorpions, lizards, bird eggs, and plants. Meerkats also prey on and attack snakes, even poisonous ones! Meerkats are usually about a foot in length and two to 43 ounces in weight. These small critters have a lifespan of 10 years. During their life, female meerkats typically have two to five offspring. Meerkat mothers have a very unique system: when a new mother leaves her babies to hunt and forage for food, a ‘babysitter’ meerkat will take care of the babies in her place. Though they are small and cute, the meerkat can also be dangerous to humans. Like some kinds of mongoose, experts believe that meerkats carry rabies. 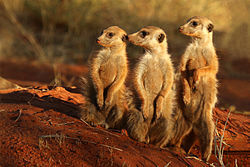 Many meerkats have been hunted for this reason, but they still exist in large numbers across the dry lands of Africa.